Delhiites, normally, prefer fermented Soybeans soup (Miso) in Bonito Dashii Broths, while Kelp and Shitake Mushroom soups are ordered more in Mumbai. Traditionally, soups across India are consumed in the form of shorbas in the north, saars in the west, a big influence of Chinese style soups in the east and lentil soups like the rasams and Mulligatawny in the south. The primary ingredients in traditional cooking include a lot of grains, spices, bone broths and vegetables, which we seem to be getting back to with a lot of innovation today. Thanks to the disposable incomes of people in most tier-I and tier-II cities and experimenting taste buds, consumers are open to venturing out more and experiencing new things. Today’s consumer is far more aware and well-travelled, which in turn gives chefs more scope for innovation and additions to their menus. The cuisine barriers are somewhat broken and chefs have started infusing ingredients from different countries, cuisines and styles to suit the palates of the new-age diners. If you like your soups thick and creamy, Chef Ruchira Hoon, Bakery Partner and Chef - The Piano Man, won’t make it for you. Yes, you heard that right. She won’t! Meat soups with bone broth are what she likes to work with and she feels that the best style to stick to soups is the pan-Asian. Chef Ruchira’s favourite is the Dashii stock and she believes that all soups are meals in their own right. She uses a lot of local produce and meat stocks in her soups, which are flavourful and wholesome. One would find a lot of fresh vegetables, a variety of mushrooms and vermicelli in her preparations and she doesn’t like an overdose of spice. Ruchira also likes to use grains like barley in her soups and does amazing combinations of two-ingredient soups like pumpkin and coconut, etc. Even today, traditional soups remain favourites for many, like the sweet corn soup, manchow soup, tomato soup, clear soup with vegetables, and so on. However, with more and more people becoming world travellers, they are looking for international soups like minestrone, French onion or miso soup as well. Various cuisines serve the best of the soups in their regions in different forms, which can be had in mornings or evenings. Many countries serve soups where they can be had as breakfast or lunch or dinner time. For example, the miso soup in Japan is a staple in breakfast. Lunches are mostly heavier and people prefer to have soups as a whole meal which includes vegetables, proteins or noodles in it so that they feel full and light at the same time, like the Vietnamese PHO, hot ramen noodle soups and hot pots. Chef Vaibhav feels that dinners are less preferable for soups as people are drinking more beverages as compared to soups. According to Chef Tarun Sibal, Owner, One Fine Meal, and Partner at Café Stay Awoke, as far as soups are concerned, the Oriental style pots and the European style purée soups work the best. And the consumers are more likely to favour this style when it comes to Potage. The other interesting category is the meal bowl soups consisting of broth, protein, starch and seasonal vegetables. “Ingredients for me need to be seasonal, local produce to get the best from the bowl I create. Fresh peas will taste absolutely brilliant when available in the winters in Delhi compared to the frozen ones which are available all year. Beetroot has been my favourite this season and the combination of beets with fresh coconut cream has been the stellar combination with a hint of black pepper,” says Chef Tarun. The Chef feels that consumers’ tastes have changed, indeed. Abundant availability of produce locally and the know-how of its usage are two main reasons behind this shift, be it avocados, quinoa, barley or chia. “Pairing is more art than science. The way Black-on-Black works, similarly White and Black also is a combination. With food, some combinations work because they are a match made in heaven and some work on the concept of contrast,” says Chef Tarun. Chef Vikram Khatri, Business Head & Head Chef Guppy & Poke Bar, Delhi and Hello Guppy in Mumbai, feels that Delhi normally has fermented Soybeans soup (Miso) in Bonito Dashii Broths, while Mumbai prefers Kelp and Shitake Mushroom soups. 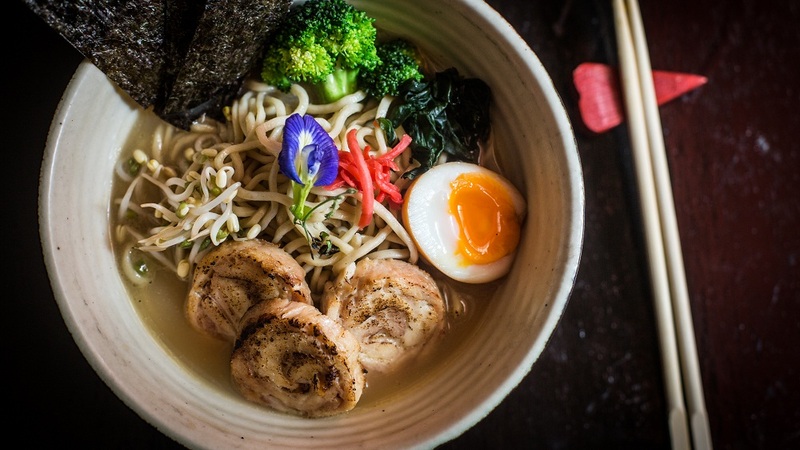 Currently, in Delhi, the Ramen Noodle Soup at Guppy is flying with Delhi winters. The choice of soup primarily is Carrot, Mushroom, Rich chicken, Pork tonkotsu and seafood – all of which are perfect meals in bowls to be consumed at any time of the day. From Smoked Pumpkin to Chicken Paitan, from Carrot Gochujang to five-mushroom Suimono Clear Soup – clear soups with fresh vegetables and light broths are in all the way! Chef Vikram feels that instead of three-course meals, what we love is the concept of the thali or bento where the choice could be more.